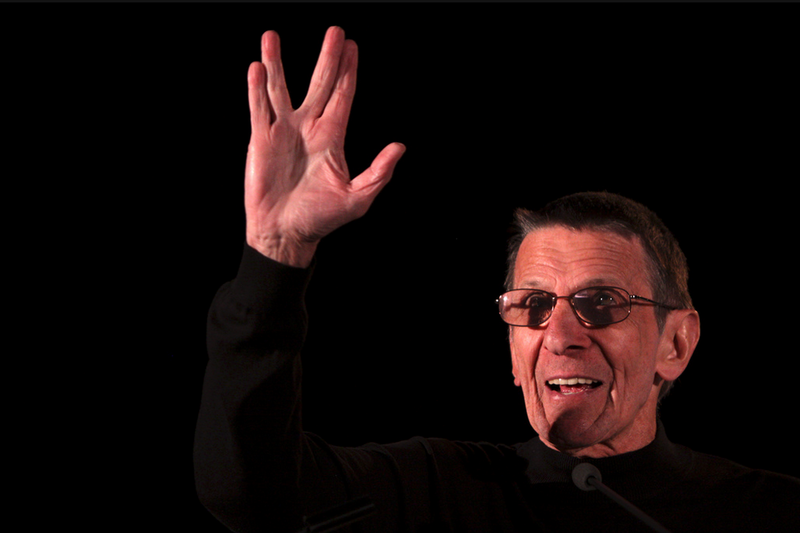 Leonard Nimoy, Star Trek’s Spock, has died. The cause was pulmonary heart disease. He was 83. Spock was the half human, half Vulcan first officer of the Starship Enterprise. And Nimoy turned him into a cultural treasure. Starkly logical but still empathetic, Spock explored what it means to be human. His character was the unlikely best friend of Captain James Kirk, and he immortalized the split-fingered Vulcan salute. He also wrote poems and music, some of it silly but still beloved by fans. He performed spoken word on stage and directed two “Star Trek movies: The Search for Spock, and The Voyage Home. And light-years away from sci-fi, he directed the successful comedy ‘Three Men and a Baby’. Though he’s now moved on to new frontiers, the memory of Leonard Nimoy will endure. 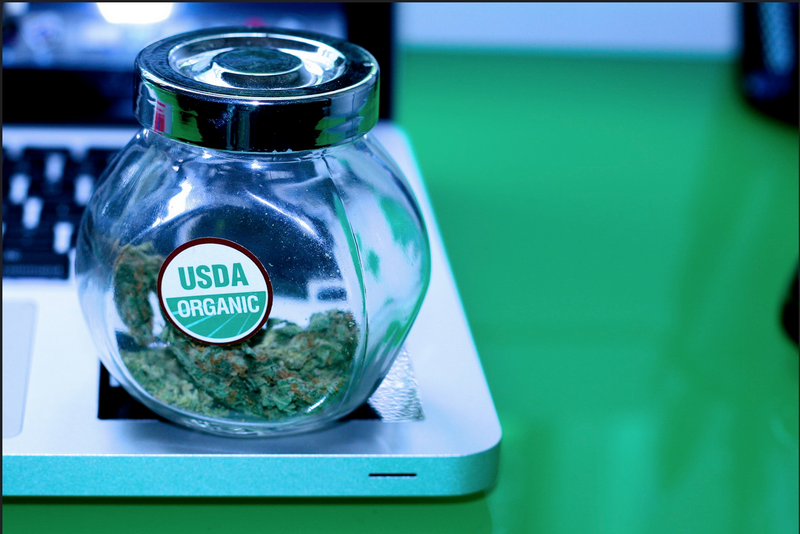 Host 1: Starting this week, you can legally grow and use marijuana in both Alaska and Washington D.C. That makes four states where recreational pot is legal. Host 2: Allen Saint Pierre is the executive director of NORML, an advocacy group in D.C. working to normalize the use of marijuana. He says these decisions moves the nation one step closer to legalization. The Nation’s governors will convene in Washington this weekend for the winter meeting of the National Governors Association. It will be a chance for the presidential hopefuls of the group to present themselves on a national stage. With less than a year to the Iowa caucuses, Tyler Daniels reports that this election cycle the GOP may break a recent pattern of presidential nominees with Ivy League backgrounds. Barrack Obama, Bill Clinton and George H.W. Bush all have degrees from Harvard or Yale. George W. Bush has degrees from both. 2012 presidential opponent, Mitt Romney has two degrees from Harvard. Former Florida Governor Jeb Bush graduated from the University of Texas. But Governor Scott Walker didn’t graduate at all. He enrolled in Marquette University, but he dropped just before he ran for State Assembly. If Walker wins Republican nomination – he’ll be the first major party candidate without a college degree since Barry Goldwater – In 1964. If he becomes president, he’d be the fist without a degree since Harry Truman. New York Times columnist Frank Bruni doesn’t think any of that necessarily is problem. Bruni has a book coming out next month called – “Where You Go Is Not Who You’ll Be”. And it makes the case – you don’t need to go to an elite school to be a success. Most Americans don’t care if their president went to a fancy school, according to Drew DeSilver from Pew the Pew Research Center, which polled Americans last year. Only 19 percent of Americans said they’d be more likely to support a candidate who attended a prestigious university. Frank Bruni thinks that the fact that the last four US presidents went to elite schools is a bit of a coincidence. BRUNI: I think it has a lot less to do with Americans saying I want a guy from Harvard or I want a guy from Yale. Than it has to do with some of the advantages of networking. The first people many political candidates turn to for contributions are their classmates from college or grad school. Its not it’s not an elite degree that makes you president, but it might be a presidential personality that gets you an elite degree. Forbes recently ranked Masters in Physician Assistant Studies the Best Master’s Degree for Jobs. This is good news for women in STEM fields as roughly two out of every three Physician Assistants, or PAs, are women, according to the National Commission on Certification of Physician Assistants. The job of physician assistant has been around for nearly 50 years, however it is still a relatively unknown field. PAs “practice medicine on a team under the supervision of physicians and surgeons. They are formally educated to examine patients, diagnose injuries and illnesses and provide treatment,” according to the Bureau of Labor Statistics (BLS). The field of PAs is growing rapidly throughout the country, largely due to gaps in the current healthcare system. PAs fill those gaps typically by seeing patients, often in lieu, but under the supervision of a doctor – in various medical practices ranging from emergency rooms to urgent care facilities. BLS projects that between 2012 and 2022, the field of PAs will increase by 38 percent to 120,000. Pay for PAs is appealing. In 2012, the median Physician Assistant took home over 90 thousand dollars. While that is not as much as doctors make, PAs also do not have to go through as many years of schooling or residency to practice medicine, which means significantly lower upfront training costs. This can make the PA degree more attractive than the MD to some, as it can offer more flexibility, especially for women. But DeAngelis doesn’t see a difference between the way men and women are treated in the profession. Going to PA school is no walk in the park compared to attending medical school. Most PA schools require good grades several and science courses in an undergraduate school. Additionally, it’s common for a PA school to have a more selective acceptance rate than a medical school. Pupils at the Yale School of Medicine went through an acceptance rate of just 6.5 percent. But that’s more than double the 3.3 percent acceptance rate Yale’s PA school. When hundreds of thousands of demonstrators clogged New York City’s streets last month chanting, “Hey, hey, ho, ho, climate change has got to go,” their message was mostly a familiar one: world leaders need to act to save the planet. Here and there in the crowds were some pockets of protestors with a less obvious chant. “Hey Obama, don’t deport my mamma!” they yelled. That message came from immigrant community groups, using the huge rally to promote a lesser-known climate cause – the push for formal acknowledgement that environmental issues are a major factor in migration, and that those who flee to the U.S. from Mexico and other countries ravaged by the environment should not be penalized. In the last 20 years, Mexico has seen an uncharacteristic drought robbing many rural farmers of their livelihoods. And a 2009 report by the United Nations University predicts that rain levels and runoff could continue to decrease in parts of Mexico by up to 70 percent over the next century. Up to 7 million Mexicans are projected to emigrate to the United States over the next 65 years due to displacement from climate change, the study said. On the street at the march was a multitude of artwork that consisted of realistically shaped, two-dimensional wooden props in the shapes of corn, turtles and life-sized printouts of people. The people represented on the signs: migrant farmers from around the world who have been displaced due to climate change. The marchers also highlighted other causes of displacement: pollution, or land takeovers by large multi-national companies in Mexico. “I think that a lot of the messaging fails to mention how migrant communities are being impacted. And we’re directly impacted,” said Sonia Guinansaca, from Culture Strike, a Latino migration organization that uses artwork in its advocacy for immigrant rights. Fernanda Espinosa’s group, Ropavejeros – part of an immigrant worker art collective, manufactured a float mounted on four bicycles in the shape of a large tree trunk – with a bird’s nest atop and axes protruding along the sides. Emigrating from Mexico or Central America does not guarantee an escape from pollution or climate change. 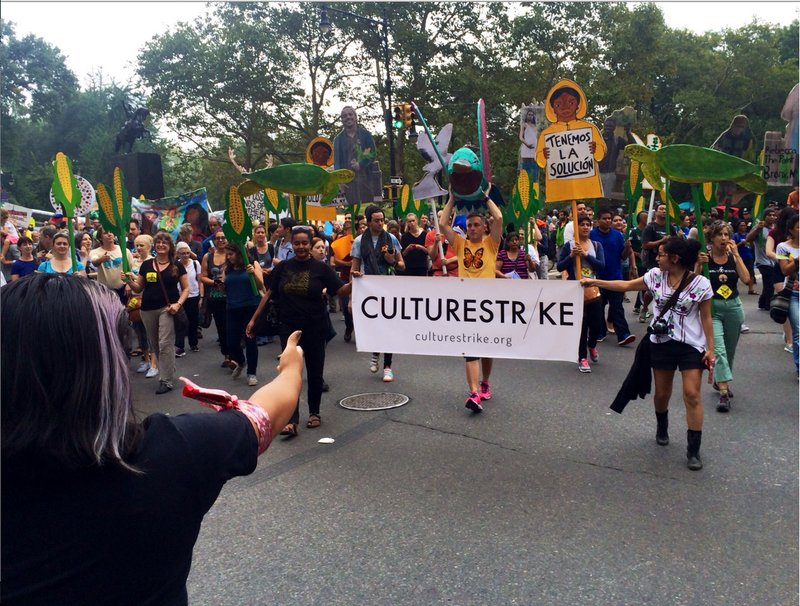 “A lot of the people who have migrated in the US come to live in neighborhoods like the Bronx or east Harlem,” said Eliana Godoy, marching with Culture Strike, naming two neighborhoods where high asthma rates are often attributed to air pollution.